Al Davis was a gambler, gangster, and one of the most feared men in professional football. Davis didn’t let anything stand in his way. He will always be remembered as one of the most controversial owners in NFL history. If there was a rule he didn’t agree with, he had no problem breaking it. 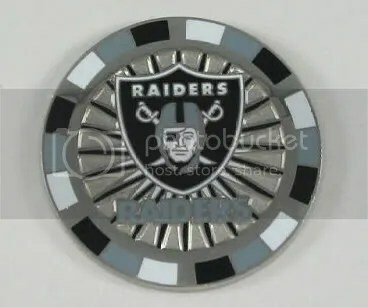 That’s why I thought this Oakland Raiders poker chip pin would do well for this week. These are easy to find and aren’t that expensive. An Irving, Texas-based company is offering a new solution to guard against fraud in the lucrative sports collectibles market. Prova Group’s system uses RFID technology to provide an easily-accessed record of exactly when, for instance, a Jets jersey was inked with the Brett Favre signature which could make it valuable in coming years. When an item of sports memorabilia is entered into the Prova Group’s records, it is affixed with a Prova Tag, an RFID-enabled tag encoded with a unique identifying information. When the item is autographed, the time, location and other information is recorded into Prova’s online database by a witnessing Prova Group representative.